i went to shabu house friday night with 3 friends. it's a small restaurant that has a giant horseshoe shaped bar custom made to hold an individual hot pot and burner for each seat. the bar was full when we arrived and we were sat in one of the few tables in the restaurant. the tables seemed have been put there as an afterthought to the original design of the restaurant. the restaurant was packed at 8:30.
i was looking forward to my first shabu shabu experience. shabu shabu or japanese hot pot literally means "swish, swish" in japanese which refers to the swishing sound chopsticks make when dipping and moving raw items around in hot broth . first of all, i was disappointed to find that the restaurant is run by chinese people, but i should have known. somehow i was expecting an authentic japanese experience. here, everyone gets their own individual hot pot and burner. everyone is required to order 1 shabu setup (no splitting). the choices were beef, more beef, seafood, beef & seafood (double food), veggie, and veggie deluxe. the cost was $11.99 to $18.99 per plate/person although veggie might be a little cheaper. the beef looked like thinly sliced ribeye, a heavily marbled meat. each person also got a plate of assorted veggies, bean thread noodles, and other goodies such as fish balls, rice cake, tofu, taro root, and bean curd skin, as well as 2 dipping sauces which were quite good: sesame & soy sauce/ponzu. i prefer family style hot pot. the communal effort is fun. you are required to order too much food. i couldn't finish half my plate of beef. the broth is almost tasteless when it comes to the table. the seafood was almost all frozen. i didn't need to know with certainty that the seafood i was about to eat wasn't fresh. there is a lack of meat variety. a pork, chicken, and lamb option would be nice. value. the hot pots at tan tan are $22.95 - 25.95 and feed 3 to 4 easily. i think i'm on a bit of a hot pot tangent right now. i look forward to trying sinh sinh's version soon. i also know that lucky pot, sichuan cuisine, and fu fu cafe serve it as well. In Japan, Shabu Shabu is usually served with beef. The soup is usually boiling water or dashi broth. This is what they called shabu shabu. ive had shabu at a few different places and i really appreciate the taste. Japan is known for their simplicity, thats why the broth is so light yet the dipping sauce is so flavorful...its a good balance. Original shabu is made with thinly sliced beef, fyi. Its definitely different than my favorite, Cambodian hot pot but is still delicously yummy imo! lol...maybe its more its more of shabu in general that you dont like rather than the place, because its pretty similar to all the other places i've been to. agreed. 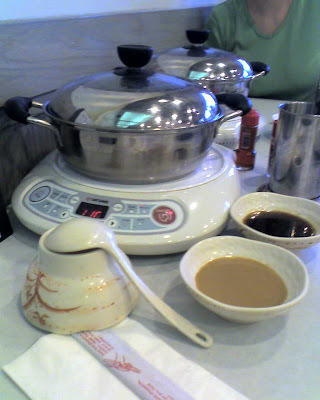 shabu-shabu has a different taste than chinese hot-pot. you don't go to long john silver's expecting british pubquality fish and chips. you're going to be disappointed, whether or not long john silver's was any good. btw, they have spicy broth now.. but yeah., traditional Japanese Shabu shabu is supposed to be light!